Over the last 5 years, commuting by bike has risen 25%, according to the U.S. Census Bureau. Dozens of companies have sprung up to fill the demand. 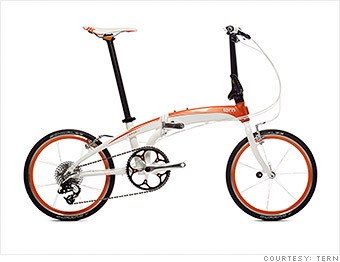 This folding bike from Tern is ideal for city dwellers. At just 21 pounds, it's light enough to lug up a flight of stairs. When folded, it's about the size of a carry-on bag -- easily fitting into tiny apartments or taxi trunks. The lightweight, compact size and 10 gears will set you back about $1,800. The company, founded year and half ago, has seen growth rates of 20% to 30% despite the generally lackluster economy.